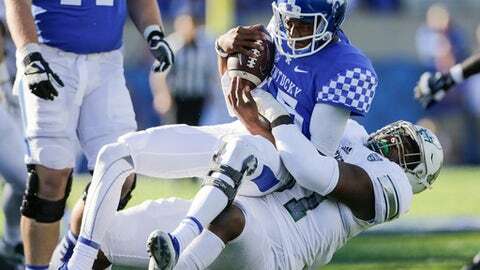 LEXINGTON, Ky. (AP) On the brink of letting another game slip away, Kentucky thwarted Eastern Michigan’s last-ditch rally quest on Mike Edwards’ end-zone interception in the final seconds. The Wildcats made a few clutch plays against the Eagles, which were necessary on a day they again struggled for consistency. And they’ll take moving on from a not-so-pretty win after having to pick up the pieces from their devastating loss to Florida. Benny Snell scored on a 12-yard run early in the fourth quarter after Josh Paschal’s blocked punt, to provide a 24-14 cushion. His TD followed the second of Kentucky’s big special teams plays that allowed the Wildcats (4-1) to pull away from the Eagles in a closer-than-expected contest against the Mid-American Conference school. The Wildcats’ first key play was Tristan Yeomans’ recovery of a muffed punt at EMU’s 42, leading to Austin MacGinnis’ 39-yard field goal that broke a 14-all tie late in the third. EMU (2-2) wasn’t done, getting within four points on Ian Eriksen’s 2-yard TD run with 2:34 remaining. A missed extra point forced the Eagles to have to go for a TD on their final opportunity, and the Wildcats had plenty of coverage on Brogan Roback’s desperation pass that Edwards had measured all the way. That play alone showed the Wildcats learned a little something from last week’s 28-27 loss to the No. 21 Gators, who scored 14 unanswered points in the fourth quarter because of communications breakdowns that left receivers uncovered. Kentucky won on the day it honored former Wildcat Nate Northington on the 50th anniversary of his breaking the Southeastern Conference’s color barrier in football. Eastern Michigan: The Eagles outgained the Wildcats 312-228. They also had late chances despite trailing by 10, but that desperation demonstrated how those special teams’ breakdowns hurt. Roback finished with 256 yards on 26-of-43 passing and a TD, but threw two interceptions. The Eagles fell to 0-10 against the Southeastern Conference but Roback wasn’t shocked that they played Kentucky close. Kentucky: The Wildcats initially looked hung over from the Florida loss with out-of-sync play on both sides of the ball. Quarterback Stephen Johnson rebounded from a first-snap fumble that set up EMU’s touchdown on the next play to throw first-half scoring passes of 20 and 7 yards to Greg Hart and Tavin Richardson, respectively. Johnson finished with 175 yards passing but was sacked five times. Rushing yards were few for both teams, with Kentucky’s run defense reclaiming its stingy ways by allowing Eastern Michigan just 13 yards rushing on 27 carries. That’s the lowest allowed by the Wildcats since Samford finished minus -2 on the ground in 2012. At the same time, the Wildcats managed just 53 yards on 37 attempts against the Eagles. Eastern Michigan: Visits Toledo in MAC play on Oct. 7. Kentucky: Hosts Missouri in SEC play on Oct. 7.